I would recommend this place to anyone looking for a nice place that’s unique and Beautiful! 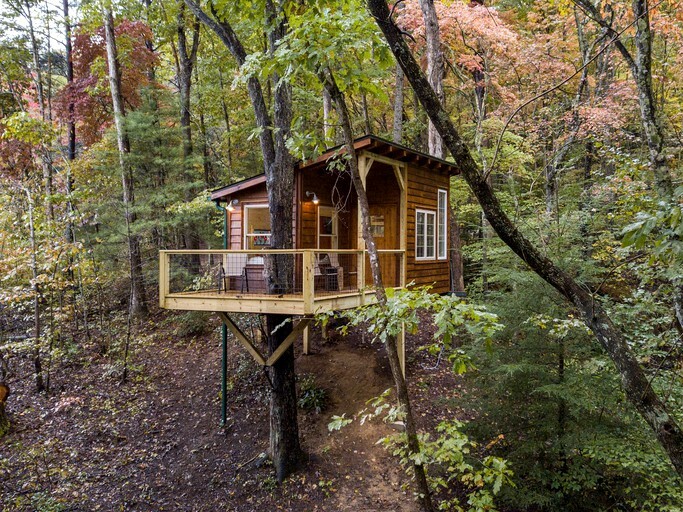 Relax in the mountains at this treehouse for a romantic getaway, in Southeast Tennessee. The treehouse has everything guests will need to enjoy a few days of relaxation. Glampers can bring their pets, as the property is pet friendly, with no additional pet fee. 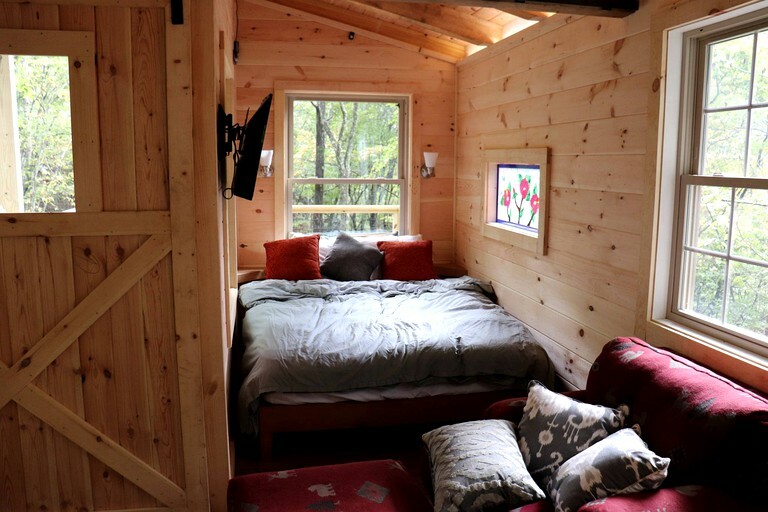 The treehouse features a queen size bed and a twin sized futon, comfortably sleeping two to three people. Located just outside of Copperhill, Tennessee, the property is close to premier hiking, a river, and waterfall locations. There is also spectacular dining and shopping options a short drive away. Features include heating and air conditioning, and a TV with Netflix and Hulu. There is also a Bose Bluetooth speaker available for guests use. There is a kitchenette which features a half-size refrigerator, a cold water sink—no hot water in the treehouse—, a microwave, a coffee maker, a water boiler for tea and hot chocolate, a mini rice cooker, and a toaster. There is a bathhouse 40 yards away from the treehouse which has two hot showers and two bathrooms with hot water, all with heating and air conditioning. There is a washer and dryer available for guest use upon request. Hosts will provide all linens, towels, soap and shampoo necessary for the stay. On the wrap-around porch, there is a grill with a side burner for additional cooking needs. The hosts provide tea, coffee, creamer, sugar, and coffee mugs. Basic cooking items such as rice, salt, pepper, spices, oil, utensils, plates, a pot, a pan, and a cast iron skillet are also included. Guests will feel very comfortable during their time up in the trees as the tree house has been thoughtfully designed and furnished. Linens and towels are provided by the hosts and the tree house and bathhouse have heating and air conditioning. Cooking will be a breeze thanks to the kitchenette area, complete with sink, a coffee service, a toaster, a microwave, a half-size fridge and freezer, and the hosts also supply a gas grill with side burner for use out on the large deck that is furnished to ensure that glampers can spend time enjoying the views from above. There is a bathhouse with heating and cooling just 40 yards away from the tree house that features two bathrooms and two showers and has heating and air conditioning as well. 24-hour check-in is available with a keypad. 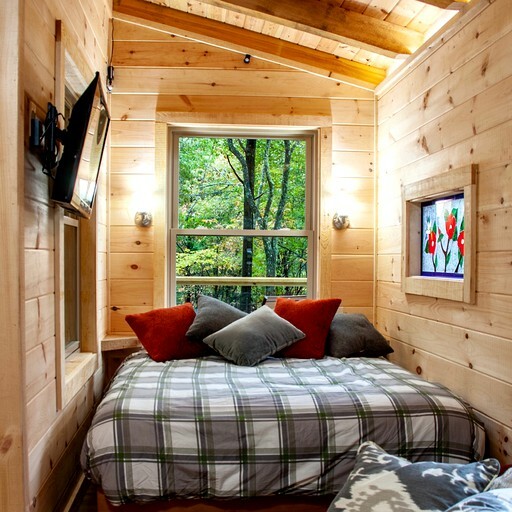 A free mini-course on tree house building is available upon request and prior approval. 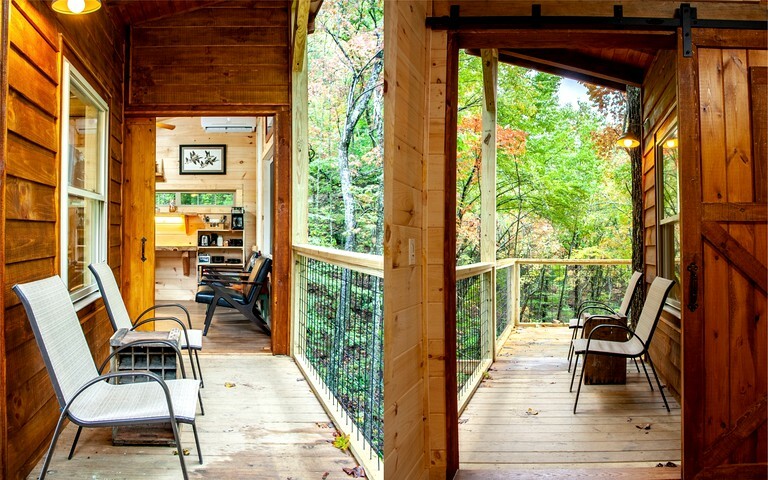 For something truly unique, guests are invited to spend their next vacation up in the trees in this fabulous rental that can be found in a secluded setting in Copperhill, Tennessee. The small town is a perfect spot for glamping as it is very remote and Is close to miles and miles of trails for hiking and mountain biking. Guests will also find themselves on the North Carolina border, with the expansive Cherokee National Forest and Nantahala National Forest just a short distance away. There are also various lakes, rivers, and waterfalls in the area if guests fancy enjoying some water activities while glamping. 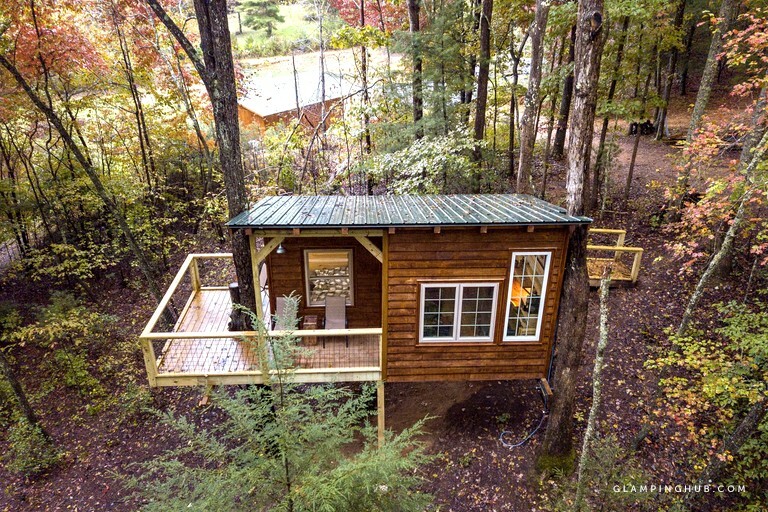 Glampers may fancy taking things easy during their retreat and simply enjoying spending time up in the trees. However, they will find plenty of exciting things to see and do In the local area. 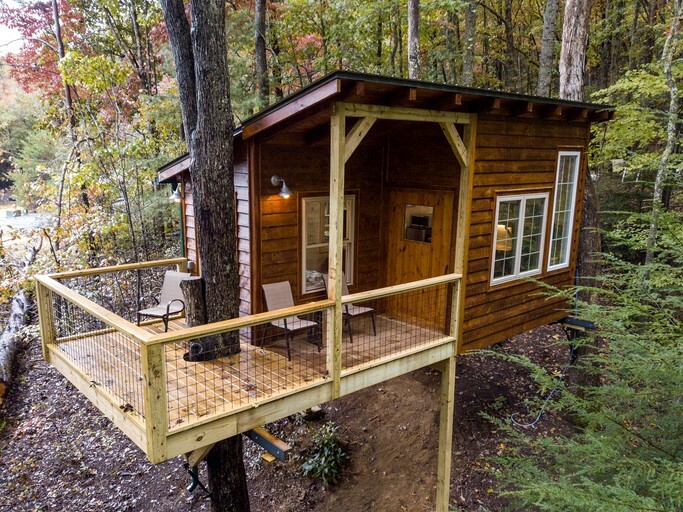 The tree house is located in a secluded spot in the forest and Is close to hundreds of miles of trails that are wonderful for hiking, mountain biking, and waterfall viewing. The Toccoa River, just 13 minutes away, offers world-class trout fishing, tubing, and canoeing and the Ocoee River Whitewater Center, famous for its guided rafting trips and kayaking, is just 15 minutes away. Waterfalls less than an hour away include Benton Falls, Rock Creek Falls, Conasauga Falls, Coker Creek Falls, Bald River Falls, Old Goat Falls, and Falls Branch Falls - all rated eight out of 10 or better for beauty. Other local activities include golf, zip-lining, horseback riding, high ropes course, disc golf course, caving, and scenic train rides. Pets are welcome but must be approved by the hosts.